Plant Based Vegan Entertaining – What to serve? I do just fine cooking plant based food for the two of us. Our palates have adjusted to the lack of added salt, sugar and oil to our food. Where I struggle with this food plan is what to fix for company who are not following a plant based diet and are used to the added salt, sugar and oil to their food. If I am preparing food to share with others I want them to enjoy it as much as I do – otherwise what’s the point? Every new recipe I try we analyze and decide if it might be company worthy. I am trying to build up a list of recipes that would be appropriate for entertaining and appeal to a variety of taste buds. Let me tell you this is no easy task! Having said all that I have had some success in this arena! This meal went over really well with the family and friends. 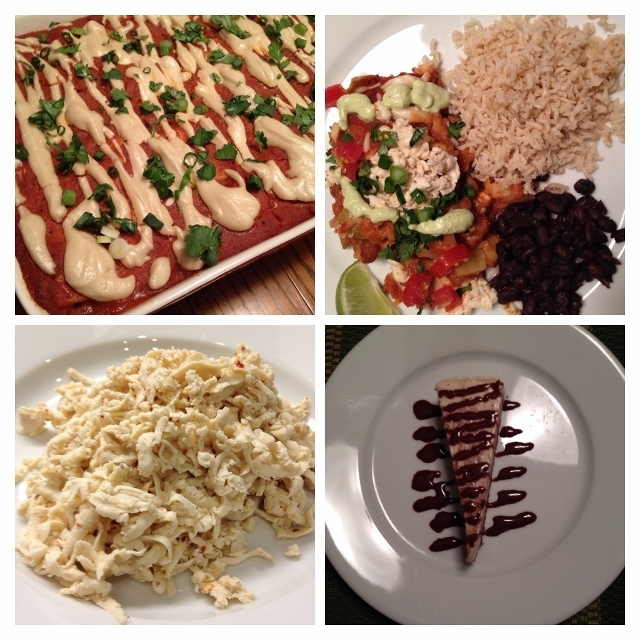 The Nirvana Enchilada Casserole is from the Isa Does It cookbook. You can watch a video of her making this recipe and get the recipe on her blog here. It’s not a week night type of recipe – it might have taken me about 1 1/2 hours to make. I didn’t actually time it because I was making several things at the same time. I would suggest setting aside a couple of hours on the weekend to make this meal and then enjoy the leftovers during the rest of the week. It just kept getting better and better! My changes to the casserole were to use only 12 corn tortillas instead of the 18 the recipe called for – I just didn’t feel like it needed that many. I added chipotle hot sauce to the enchilada sauce to kick it up a notch and next time I would add another jalapeno to it too. I only used about half of the cashew sauce on top but next time I would add the extra sauce in with the layers. For toppings I made the Roasted Poblano Cream, green onions, fresh cilantro, fresh limes and home made pepperjack cashew cheese. 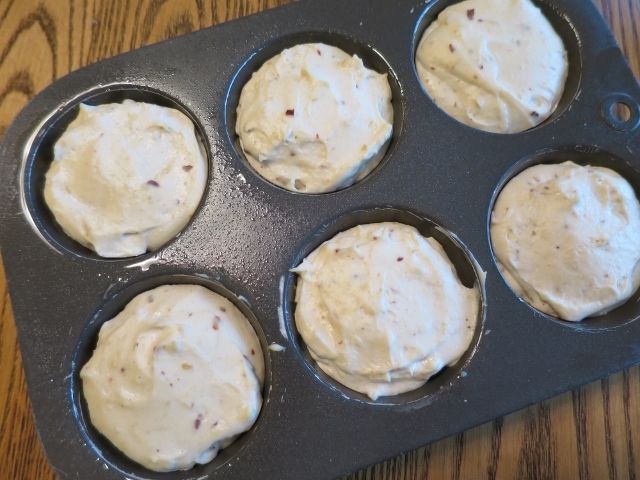 The pepperjack cashew cheese mixture is put into a muffin tin to make little cheese rounds. The cheese recipe comes from Somer over at the blog Vedged Out. Her recipe was super easy to make and the results were amazing! My family loved it! They were putting it on tortilla chips with some salsa and on the enchilada casserole. When the omnivores approve you know you have a winner! I made the cheese early in afternoon and it was set up enough to shred by dinner time. A couple days later I shredded more and it was even easier after it had time to firm up. It melts like a dream so you can use it for grilled cheese, quesadilla or whatever you heart and tummy desires! The Black Beans -Slow Cooker recipe is one of the easiest ways to cook beans. Toss all the ingredients into a slow cooker,turn it on and walk away. Love it! The rice cooker makes perfect rice every time and I love that it has a brown rice setting. If you don’t have a rice cooker be sure to check out Alton Brown’s Perfect Baked Brown Rice – it’s how I used to make brown rice before I got a rice cooker. I had intended to make my Fiesta Brown Rice for this meal but I ran out of time. It could be made ahead of time and reheated prior to serving – that’s what I will do next time. The Chocolate Swirl Cashew Cheesecake (I learned to make in the vegan cooking class I took a couple weeks ago) was a huge hit! I can’t share the recipe as the restaurant asked us not to – they do have this cheesecake on their menu so I understand. The basic recipe is very similar to this one at Vegetarian Times – sub pecans for the macadamia nuts and reserve back 1 cup of the batter – add cocoa to it and enough maple syrup to sweeten it and then swirl it into the rest of the filling that you have already put into the crust. I will share the idea they gave us for making a vegan chocolate syrup drizzle that can be used for so many desserts. Blend until smooth. Pour into a sterile squeeze bottle. It will last forever (well maybe not forever) in the fridge. Use to decorate hot drinks, cold drinks and desserts! We moved the blog to a new server this week and have been working out the kinks! The blog was only down for a few hours but then the comment function wouldn’t work, photos wouldn’t download and so forth. I think everything is now fixed but if you run across a problem be sure to email me or leave a comment and let me know. Sometimes you the reader come across issues that I would never see on my own. I shared on facebook how our Valentines Day went – be sure to check it out. I have also started posting recipes, recipe links and other fun stuff on the Nutmeg Notebook facebook page. It’s another fun way to share about food, nutrition and other good things. What are some of your favorite meals to serve for company! The meal looks absolutely wonderful! I make soft cashew cheese quite often, and we love it. I’ll have to make this version! Wow, you increased my appetite today. Looks like I have to prepare this at home right away. Will share the results if it turns out good :). it’s funny (odd not ha ha) that as much as I think OOH IM A CARNIVORE—Im mainly plantbased too. I think you have great recipes for meat eaters too! I love our rice cooker – I can make any grain in there and it always comes out perfect – just set it and forget it! Thanks Biz. We both love to cook and eat! Have you done any blogging? I don’t have a new one, last is feb 15. I have to bookmark that bean recipe. No soaking and the crock cooks it up? wow. Amazing! I kick up the spices and add plenty of oregano, garlic powder and rosemary to the sauce and the veggies. I also use Angela’s veggie burgers as the “meat” but that can be left out and still result in a wonderful dish. Thanks for sharing your ideas for serving to omnivores, I’m going to check out some of these recipes!!! Hi Laura thank you for the link to the lasagna recipe. Good to know the Omni’s approved of it! Its a challenge cooking for non plant eaters! This menu worked out well and I would make it again in a heart beat! I made this menu this past weekend and omnivore hubby liked it alot. My vegan daughter requested that I make it next time she is home she liked it so much. I did not make the cashew cheese or dessert this time but might try next time. I have been following your blog for quite a while (since before you switched over to a plant based diet) and have enjoyed it both ways. I would just like to say that I am so impressed at how you have taken on this new way of eating. I have been circling around changing my diet for quite some time now but can never quite get to the day where I totally give up meat and dairy products. I keep trying to cut back more and more but my husband is not interested in making this dietary change along with me and I feel it just makes it too difficult to deal with two dietary habits. You keep up the posting of great recipes and I might make vegetarians of the both of us yet. Great to know you are still following even though I switched gears and went plant based with hippie food as some people say! What a perfect meal for you to make for your vegan daughters visit. It makes me happy to know she liked it so much. It is really a delicious dish, Isa’s cookbooks are amazing and I highly recommend them. I had really thought about the plant based diet for quite some time before taking the plunge into it. I had read the books, watched Dr Fuhrman on tv and felt like it was the right path for me. It really made my brain do flips in the beginning just trying to figure out what our new menu was going to look like! It took a lot of time to get comfortable with it and at first it was overwhelming. Like any new change it takes time to adapt and adjust and we were able to do just that. I do believe that it was easier for me because hubby Tom agreed to give it a try. Having said that I have met many plant based women and men on line who have spouses that don’t eat a plant based diet 100% and they work it out. My hubby eats plant based about 80% of the time. I only cook plant based for us but when we eat out or he travels for business he might order beef, chicken or fish. Sometimes he goes for the plant based option because he feels better afterwards when he eats plant based. He still likes the taste of meat and sometimes he desires it. Me on the other hand – I no longer have a desire for it. In the beginning I did have an occasional fish meal and even chicken a couple of times. It’s been months since I had any fish and I have no desire to do so. I did miss Greek yogurt when I made the switch but there are some non dairy yogurts that taste good so that isn’t an issue any more either. I never used a lot of cheese because of the high fat content and my cholesterol issues so that wasn’t as big of a deal for me. However I did take a vegan cheese making workshop a few weeks ago and the instructor said dairy products and cheese in particular keep many people from going to a plant based diet. They are very addictive foods she said and the desire to have them is great. Trust me when I tell you that you can survive and enjoy food without dairy. My mother has been eating plant based for the past 3-4 weeks and she just serves my dad whatever she has made and he eats it and likes most of it. They are in their mid 70″s so they have eaten the typical Standard American Diet their entire lives. He isn’t going to give up meat but she is cooking less of it and he is quite happy with the plant based foods he is eating. Sometimes you can serve them something and not even tell them its plant based and they might not realize it. Or you can make a little meat for them and serve it along side a plant based dish that way you both are happy. So many foods, entrees, salads, soups and side dishes are already plant based or can easily be adapted to be so. Beans and rice with tortillas, chili soup with beans and no meat, pasta dishes with lots of veggies and tomato sauce, stir frys with veggies and tofu, vegetable and grain soups like a barley vegetable, tomato soup, grain salads like a Greek tabbouleh salad without the feta, falafel sandwiches, hummus and veggies, bruchetta, Indian Dal or African Peanut Stew with garbanzo beans, Thai vegetable dishes, veggie lasagna. You don’t realize how many plant based entrees people already enjoy until you stop and think about it. Some of them you just have to leave the cheese out of and perfecto – you have a plant based dish! If I can be of any further help to you, just ask. I am more than happy to share more information with you. There is a huge support system on line for plant based eaters and that has helped me a great deal. I would love to pass it forward! If there is an interest I am happy to blog more about it. I just haven’t known how many of the blog readers are wanting more information about eating plant based. Eileen I am so glad you and everyone else enjoyed the Chana Masala! Thanks for taking the time to come back and let me know. I love getting feed back like that. Have a great weekend!